The Danube courses through Central and Eastern Europe connecting its spring in the Black Forest all the way out to the Black Sea. It flows from Germany into Austria, dipping into Slovakia and then cutting through Hungary on its journey down to Croatia, Serbia, Bulgaria and then into the Danube Delta in Romania. Living in Budapest, I cross the Danube almost daily, and at the very least pass it on my morning commute on the number 41 tram. I have a fascination for this majestic river, and I have visited different parts. 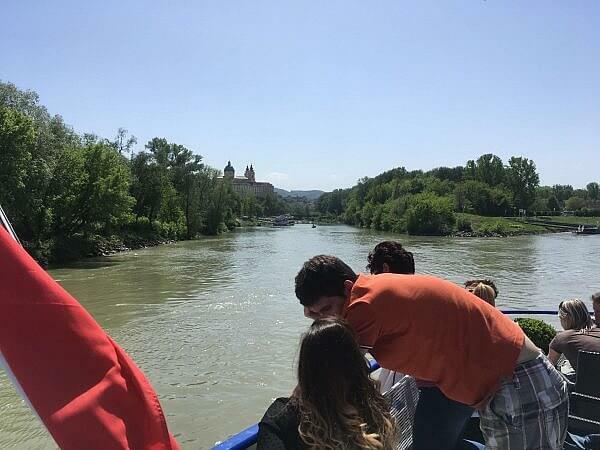 I got bitten by mosquitos at a cemetery in Serbia, overlooking where the Tisa (Tisza river to us Hungarians) river flows into the Danube, and sat on a boat in Novi Sad eating soup trying to come to terms with the fact the river is now double the size to home in Budapest. 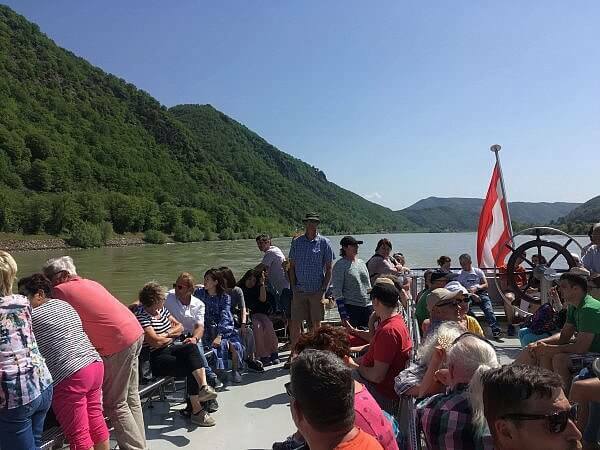 I’ve sailed up and down the river in Budapest, last year on my birthday I smuggled Becherovka and tonic onto a boat with my mother and got pleasantly tipsy by the time we reached Romai Part, I’ve crossed over the border into Slovakia when visiting a friend in Komarno, and hiked above the Danube Bend at Visegrad Castle. Yet, even though I have been to Vienna numerous times, I haven’t been to the Danube. 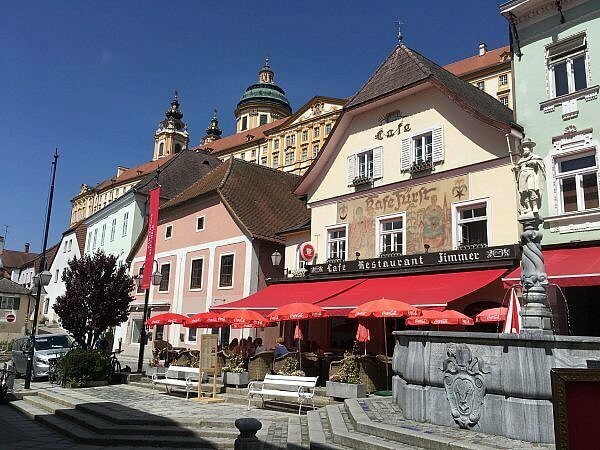 I traversed it in Austria as a child, driving back and forth between the UK and Hungary we often stopped off in Melk, but I was too young to remember. 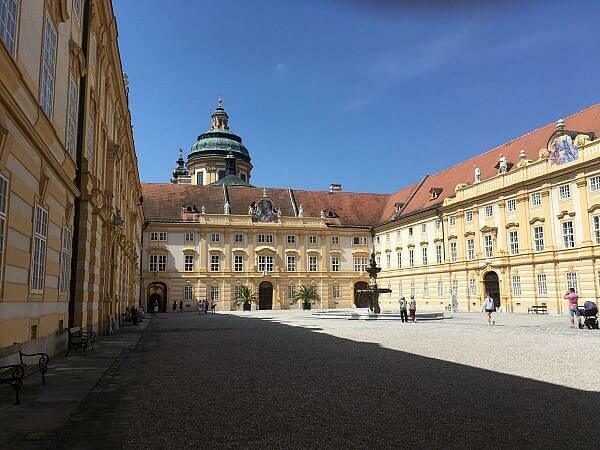 I had a day to spare, and the Wachau Valley needs to go in the book I’m writing on Vienna and Budapest right now so I took a train to Melk to explore this portion of the Danube. 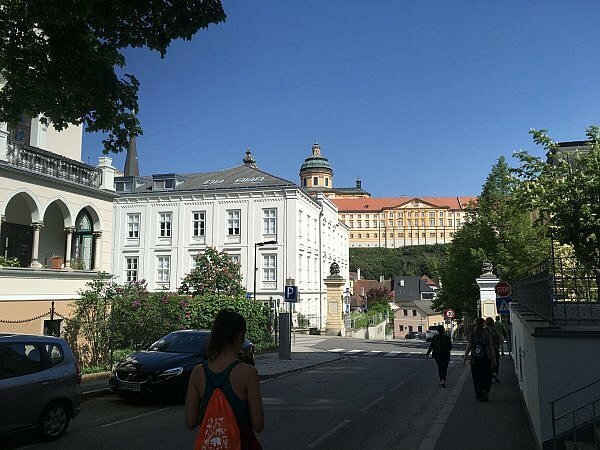 It takes an hour by train to get from Westbahnhof to Melk, and from the station it’s only a short 10 minute walk to the abbey – which already dominates the skyline when you get off. The Abbey, a huge orange-yellow structure looming over the town, is more than a museum, since it still functions as a Benedictine Monastery with 30 monks still present, and also contains a school on the premises. The museum is worth the visit, not only to learn the history of the monastery, but also for the imperial halls and the gorgeous Baroque library. The tour ends inside the huge gold-clad church, lined on the sides with skeletons of various saints. At noon, the monks host a midday mass anyone is welcome to attend, but I couldn’t stick around if I wanted lunch and make it down to the boat. Danube in this part of Austria. 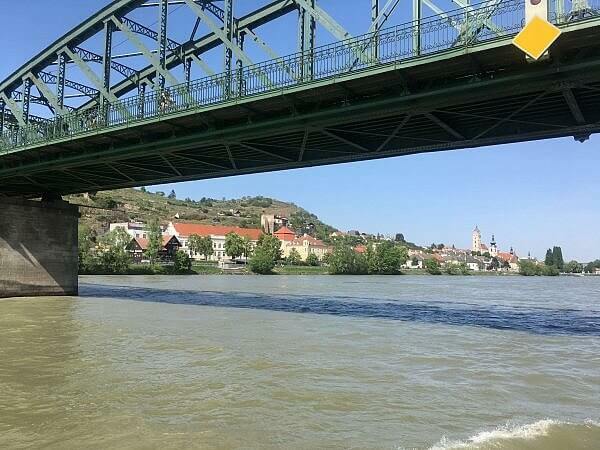 You can grab a cruise from Melk to Krems, and you can go in the other direction, too. Krems was a little underwhelming after Melk and the sites dotted along the river, so really go for the journey or get off at Dürnstein and take the bus back to Krems (or start in Krems). 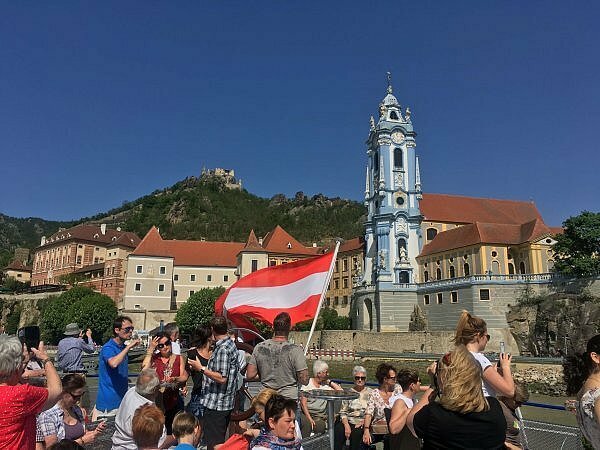 For me, traveling to Krems became more about the journey than the destination. It was 30C today, and sitting on the deck in the sun I felt like I would be fully barbecued by the time I’d reach Melk, but the moment the boat pulled out of the dock, the wind kicked up and cooled things down. 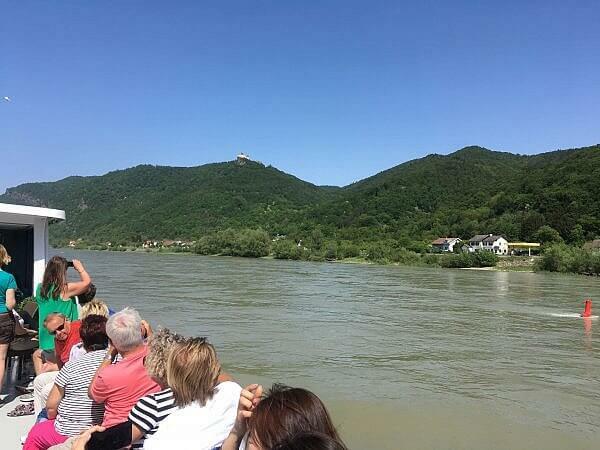 Melk Abbey receded into the background as the boat pulled along, lapping over the Danube past picturesque villages. 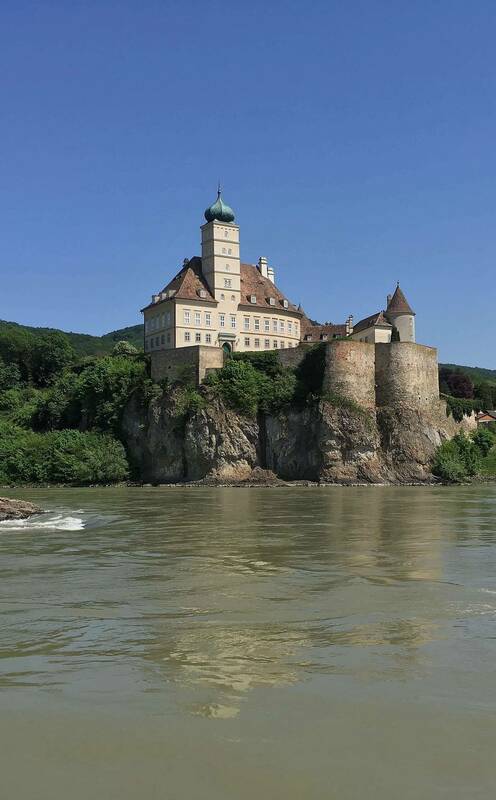 The first spectacular stop was the Schönbühel Castle, once the property of the Bishops of Passau in the 9th century this turreted bastion on a rocky outcrop on the Danube gets its look from its 19th century owners. Along the river, the valley undulates under rugged hills covered with forests or vineyards, crowned with many castles here and there. The first is Aggstein Castle, perched on top of a high hill, but it’s the Spitz and the Dürnstein Castles that are worth getting the camera out for. Dürnstein comes out sharply round the bend. I notice everyone moving to one side of the boat and the castle appears up at the top and the blue church on the bottom. 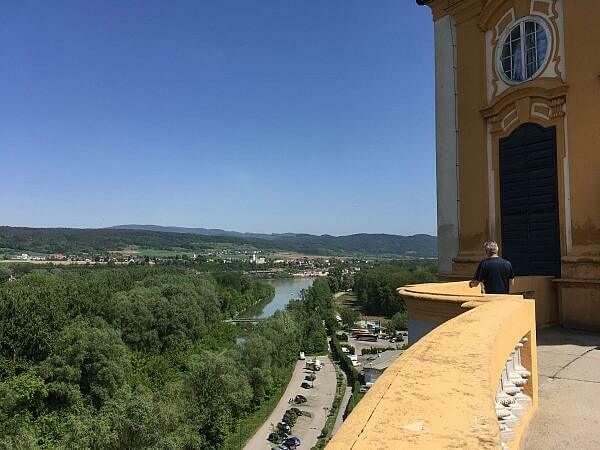 Along the way, this is perhaps the most beautiful of the sites along the river and a part of me regrets not getting off here instead of at Krems – I could have just got a bus to get my train back to Vienna. Krems is a pretty town, but one that’s confusing to orientate. It has an interesting atmosphere, enhanced today by an art festival that turned the quaint baroque streets into art installations with artists posing in balloon filled basements, near craft beer trucks and old monasteries serving cold brew coffees and vegan muffins. One day I hope I can cruise the whole Danube, but for now I am happy to do it in segments.